In a saucepan, combine 2 cups half-and-half cream, eggs and sugar. Cook and stir over medium heat until mixture reaches 160° or is thick enough to coat a metal spoon, about 9 minutes. Remove from the heat. Stir in vanilla, nutmeg if desired and remaining half-and-half. Cover and refrigerate for at least 3 hours. Pour into a punch bowl. Stir in whipping cream and soda. 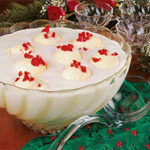 Top with scoops of ice cream and sprinkle with cherries. Serve immediately. This site was built using Site Build It!